Last year, I made a Choco-coco Sugar Scrub for some gifts and I decided to experiment with a different scent this year. 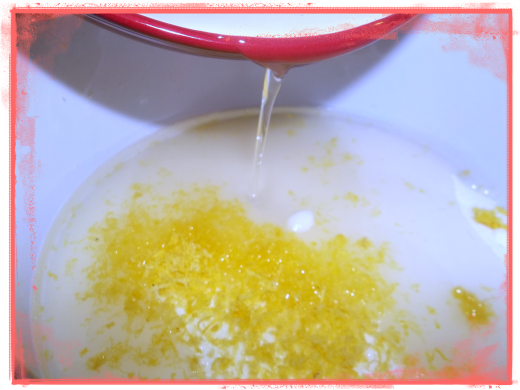 I love the fresh smell of lemons and citrus and the warm scent of vanilla and decided they would make an amazing combination for a sugar scrub. I love coconut oil and it’s properties for keeping skin soft. A scrub like this is excellent for gardeners as well as anyone who struggles with rough and tired hands and feet. 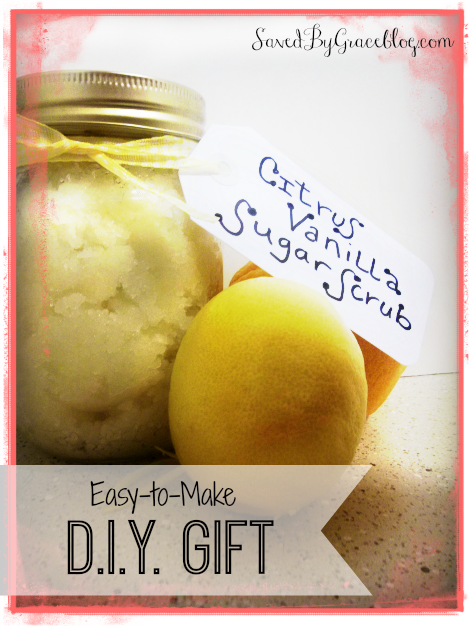 This Citrus Vanilla Sugar Scrub is sure to please anyone on your gift list and is so easy to make as well as low-cost. This recipe makes (2) 16 oz jars, but it could be split into (4) 8 oz ones. If you are only interested in making one jar, simply cut the recipe in half. Total for the materials was less than $5 a jar and I got the mason jars at the Dollar Tree. 1. Start by pouring the sugar into a bowl. Zest two lemons into the bowl with a zester or the fine side of a cheese grater. 2. While you do step 1, place the coconut oil in the microwave for 30 seconds. It should be mostly melted and in oil/liquid form, but not too hot. 3. 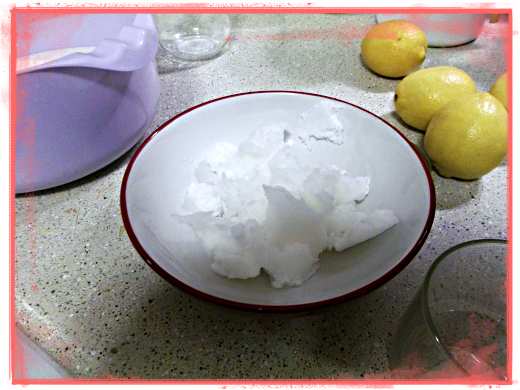 Pour melted coconut oil in the bowl with the sugar and start stirring. If it seems to wet, add a small amount of sugar to it until it has a damp sand consistency. 4. Cut the lemons you zested in half. Remove as many seeds as you can find and squeeze into the bowl. If seeds fall into the bowl, simply remove them with a spoon. Mix this in with the other ingredients. 5. Add the Vanilla and Orange essential oil and stir. 6. Spoon into jars and attach a label. To use, just take about a teaspoon out and rub on damp hands. Rinse and enjoy soft, smooth skin. This scrub will stay good for about 2 months if kept in a covered container. Update: You can also use lemon essential oil, however make sure it is well diluted by the coconut oil as it can sometimes cause irritation. I also fiund that this scrub stays well for a little longer than I had first thought. Can’t wait to make these for Christmas gifts. Thank you! Do you think I could use grape seed oil instead? How much do you think I should use compared to the amount for the coconut oil? Hi Amanda, I have not had any experience with Grape seed oil, but I would assume since they are both oils, you could substitute one for the other in this recipe. Coconut oil tends to be solid before melted, so I would use about half the amount and add more until you get the consistency you desire. The final recipe is kind of like a damp sand. Note that you will not come out with the same smell as coconut oil has a rich scent that adds to this. Let me know how it turns out! This is a great idea! I can’t wait to make this for the women in my family! Is it okay to leave out of the fridge? I have been looking at recipes and I like this one the most by far, but the other ones always mention sticking the jars in the fridge because of the lack of preservatives. You could leave it out, it is acidic enough it should not go bad for a while, but I like to keep it in my fridge so it lasts longer. I said 2 months if kept in the fridge, but you could probably have it last 3-4 if kept cold. It won’t harm it to leave it out. I t just won’t last as long 🙂 Let me know how yours turns out! I would love to hear about it! Thanks for writing me.